Home Goverment Services Melvisharam Vellore How to get a Ration Card? How to get a Ration Card? A message from Aadil in the chat box brought my attention on important issues like Ration Card. I did a small search to gather information about it and landed my thoughts to explain two things: First - about ration card with its need, second - How to get the ration card……procedure to get ration card. I hope this information is helpful to our community. In case, of error, please give your valuable comment / feedback for corrections. A Ration Card is a very useful document for us as it helps save money by aiding in the procurement of essential commodities at a subsidized rate. It has also become an important tool of identification now-a-days. You may need to produce a copy of your Ration Card as proof of identification when applying for other documents like Domicile Certificate, for inclusion of your name in the Electoral Rolls, etc. 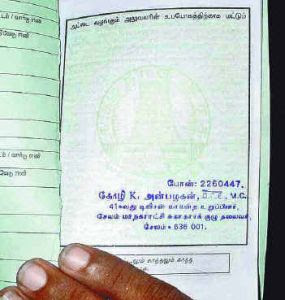 For the purpose of categorization of cardholders under Public Distribution System, the Government of Tamil Nadu have prescribed two colour cards viz., Pink and Yellow. The Pink Colour cardholders will be entitled to rice and other essential commodities at prices as fixed by the Government from time to time. The Yellow Colour cardholders would draw their rations other than rice based on options. Those who opt out of rice can draw additional quantity of sugar or kerosene as the case may be, in lieu of rice at prices as fixed by the Government from time to time. 2. Fill the form with all the details with your passport size photograph. 3. Deposit it at in our Zonal PDS Office (Walaja) and get a form for applying the card. 4. You would have to give to the office a copy of your Address Proof and Identity Proof [Voter ID card or Driving License]. 5. After that fill it and submit there itself. 6. The officer from the Civil Supplies Office from our taluk will come to visit your home to check personalities, as per the address mentioned in the Registration Form as well as the Address Proof and Identity Proof. 7. You will get a ration card hopefully in 60 days. If it doesn’t satisfy you in 60 days, contact Assistant Commissioner of Civil Supplies / Taluk Supply Officer. If you are unable get the things done there also, just try here…. Additional information related to Ration Cards….listed below in the table are the various types of forms to be filled by card holders. For issue of new Ration Card – pay a fee of Rs. 5/- with required documents.